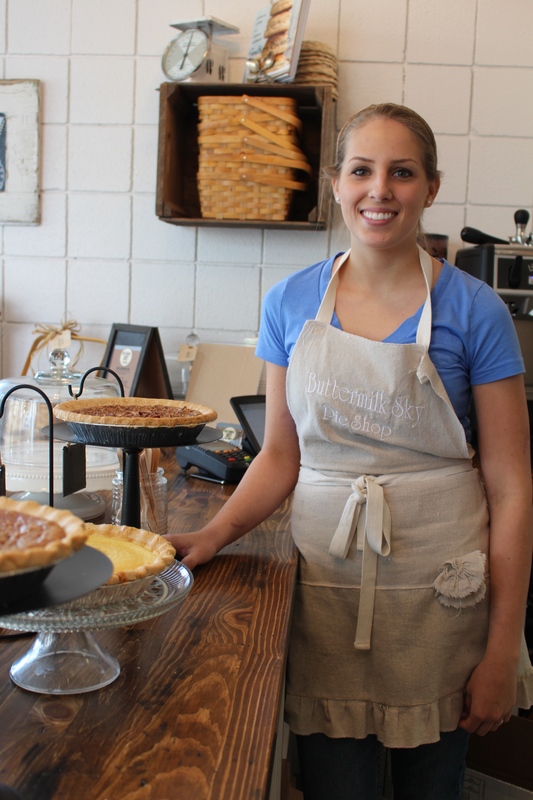 Buttermilk Sky Pie Shop: New sweet spot in Bearden! | Oh, the Places We See . 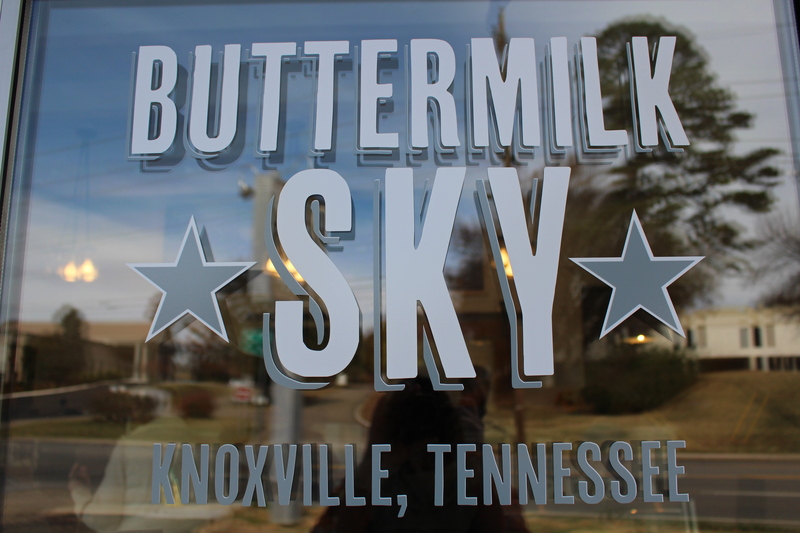 . .
Buttermilk Sky Pie Shop: New sweet spot in Bearden! Change is afoot in the Bearden area of Knoxville! And if you’ve wondered what’s up with that little white building next door to Anthropologie on Kingston Pike, wonder no more! 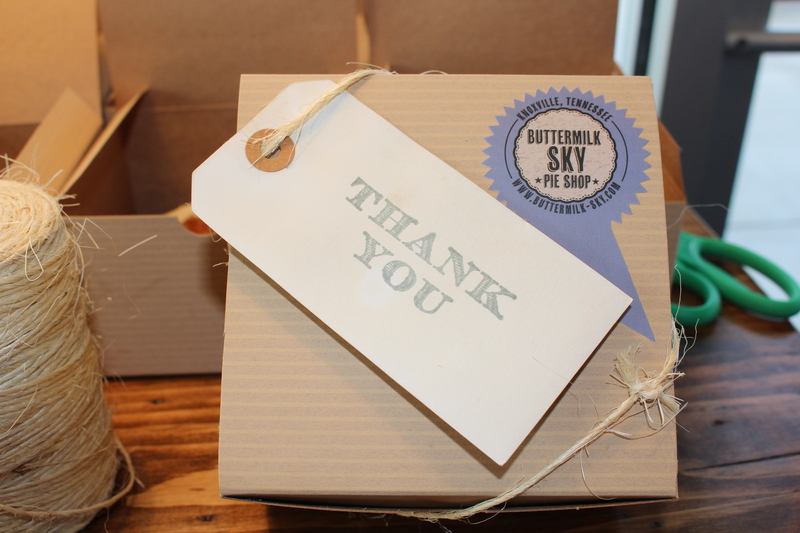 It’s Buttermilk Sky Pie Shop — and oh, how sweet it is! We first took note of Buttermilk Sky this past week. Their newly launched Facebook page already had requests for additional help to prepare for their opening this Thursday, November 14th. Then we drove past, noting that the parking lot was full, and lines were forming outside the shop! (And they’re not even officially open.) Top that with ads that say, We open at 11:00 on Saturday and will sell ’til the pies are gone! That’s when we knew: There’s a hit in the making in the Bearden area. At 11:00 Saturday, we were on their doorstep talking to the owners, Scott and Meredith Layton. Scott’s a farmboy from Missouri married to Meredith, a Memphis girl whose grandmother made homemade ice cream for family get-togethers on Sunday. 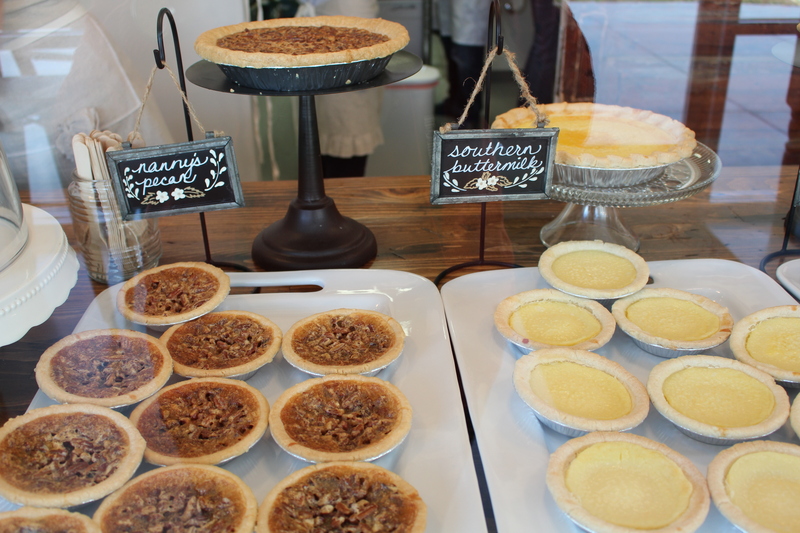 They’ve combined their love of fresh ingredients, natural flavors, and Southern cooking to bring made-from-scratch pies and ice cream to Knoxville. You’re not even open, I said to Scott, and you’re selling out already. He wiped his hands on his apron and replied, We thought last Saturday would be just a slow test run, so we made 200 pies. By the end of the day, we had sold 800! We just kept cooking and cooking all day long! As busy as they were, Store Manager Morgan welcomed us in to see the new place. 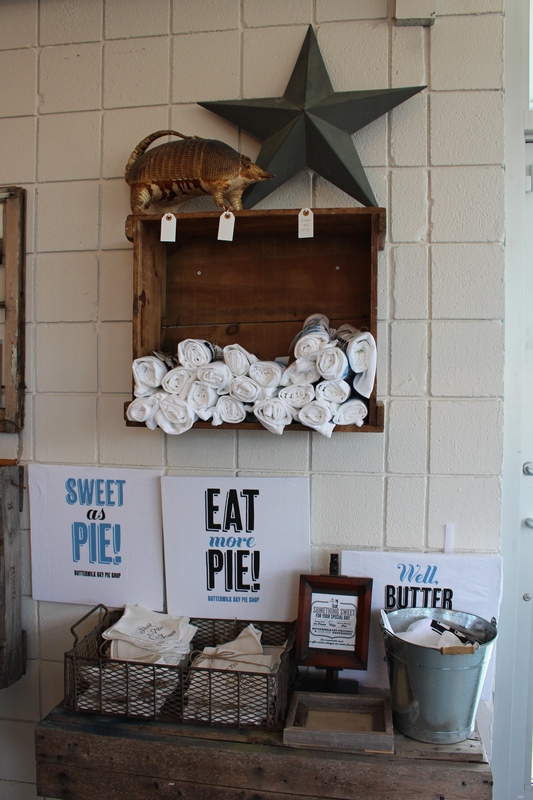 The store has a clean, yet comfortable vibe with white walls, black signage, kraft paper boxes tied with twine, and the store’s blue ribbon logo affixed to take-out orders. Looking is part of the fun — and that’s OK since you may be in line for a while, depending on when you arrive. 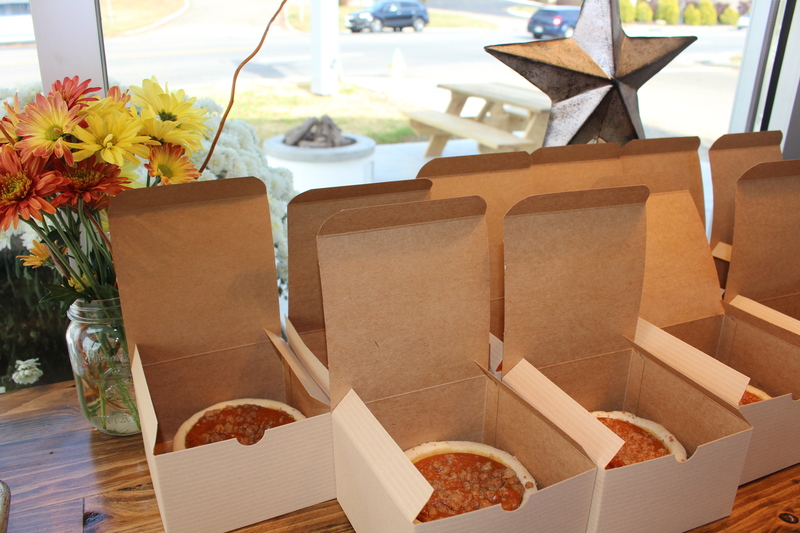 We noted boxes of seasonal favorite pumpkin pies ready for take-out, but, hopefully, their other best-sellers will be there, too: Nanny’s Pecan, Southern Buttermilk, and Chocolate Meringue. Notable are the little four-inch pies that sell for $4.25 or four for $16.00 that you can purchase as a four-pack sampler. (Which we did!) By the way, Bert loves the buttermilk pies; I prefer chocolate meringue. Also for sale is good coffee . . .
and that homemade ice cream Meredith grew up loving. 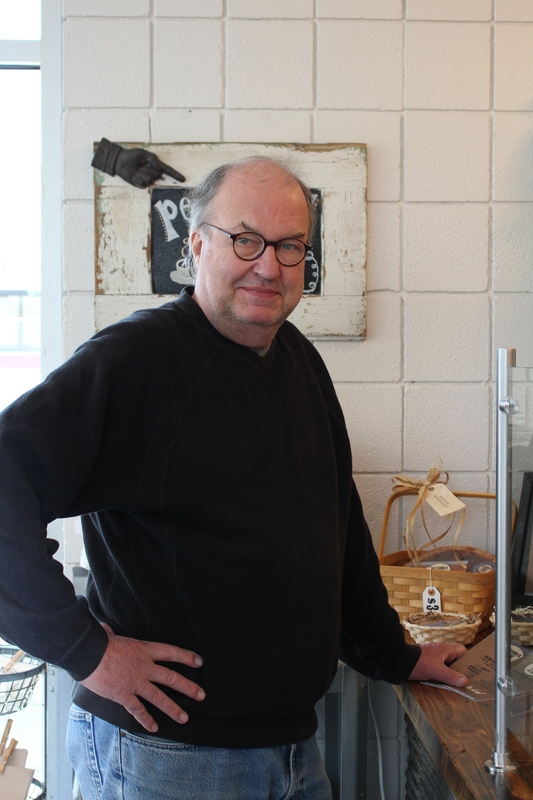 Our friend, Wayne Christensen, came for pies but did a little impulse buying when he heard about the homemade ice cream! In the not-overly-big-but-hardworking kitchen, Jenna was rolling out the dough for thumbprints which Meredith said would be ready in about an hour. Most every customer on Saturday took their orders home, but you can eat at the picnic table outside or on a stool inside. Maybe. If there’s room. But if the lines are any indication of what’s gonna happen this Thursday, there just might not be any room to breathe! A long line — and the store’s not officially open yet! 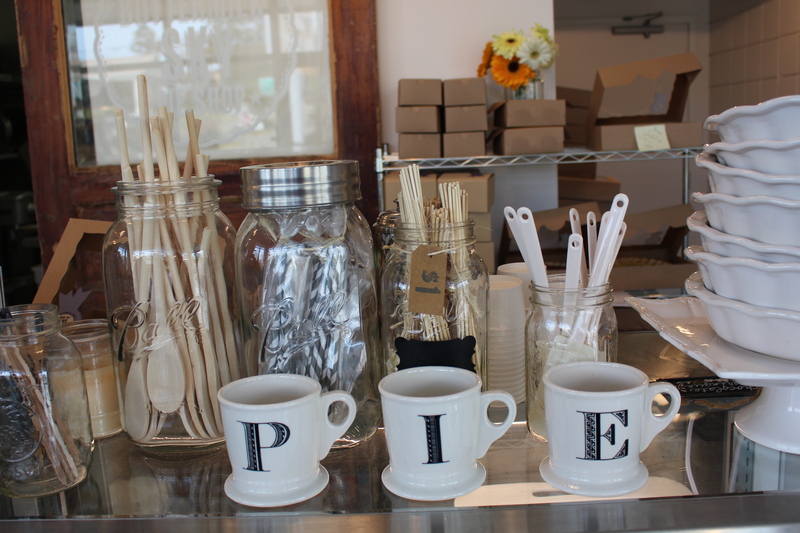 If you click here to their website, you’ll see the names of the mainstay pies: Granny’s Apple, Southern Buttermilk, Chocolate Meringue, and Nanny’s Pecan. But there are seasonal offerings in the works. This fall will bring on Spiced Pumpkin and Caramel followed by the winter delights of Kentucky Derby and Coconut Cream. 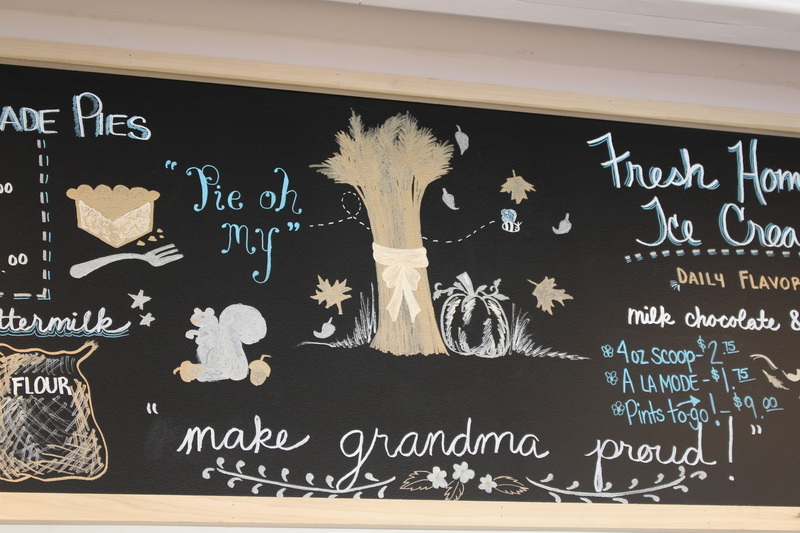 Their phrase (and mine, too): Pie oh my! 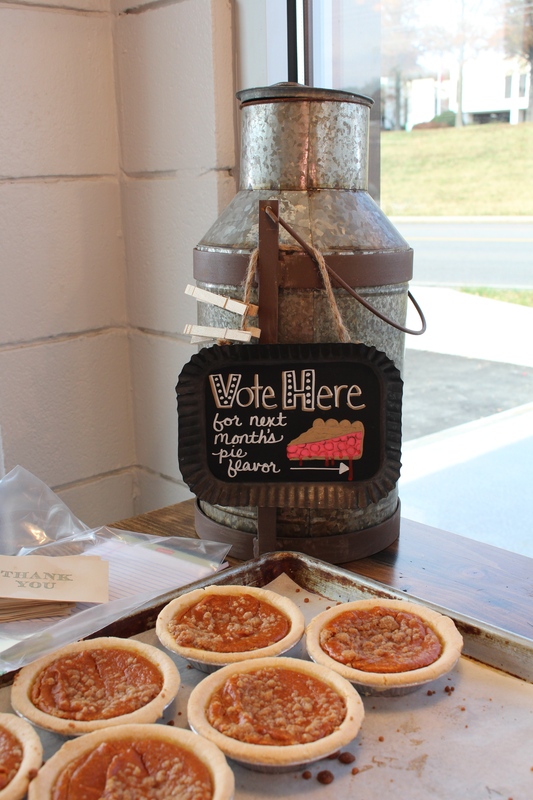 You can even vote for next month’s Pie of the Month. Something we couldn’t see yet are the Scratch Made Buttermilk Biscuits, Whipped Butters, and Biscuit Toppings like Warm Chocolate Gravy and Sweetwater Valley Farm Buttermilk Cheddar Cheese. But what we did see made us realize that this place will be busy from Grand Opening Day ’til Christmas, for sure. 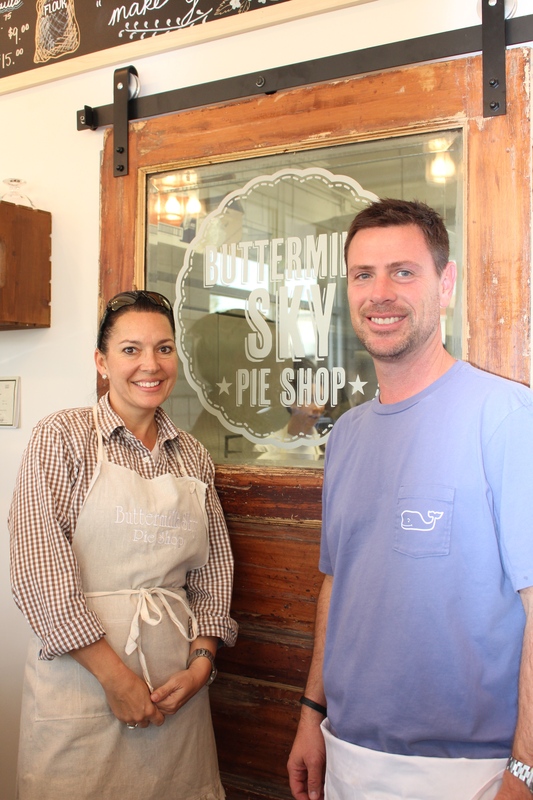 So, if homemade pie is on your list of favorite desserts, or you crave cookies, biscuits and such, you just may want to head to Buttermilk Sky Pie Shop. It really is a Sweet Spot! This post is #10 for National Blog Posting Month (NaBloPoMo) 2013. This entry was posted in Food, Restaurant and tagged buttermilk pie, Buttermilk Sky Pie Shop, homemade ice cream, Knoxville, Meredith Layton, pecan pie, pumpkin pie, Scott Layton, Sweetwater Valley Farm. Bookmark the permalink. 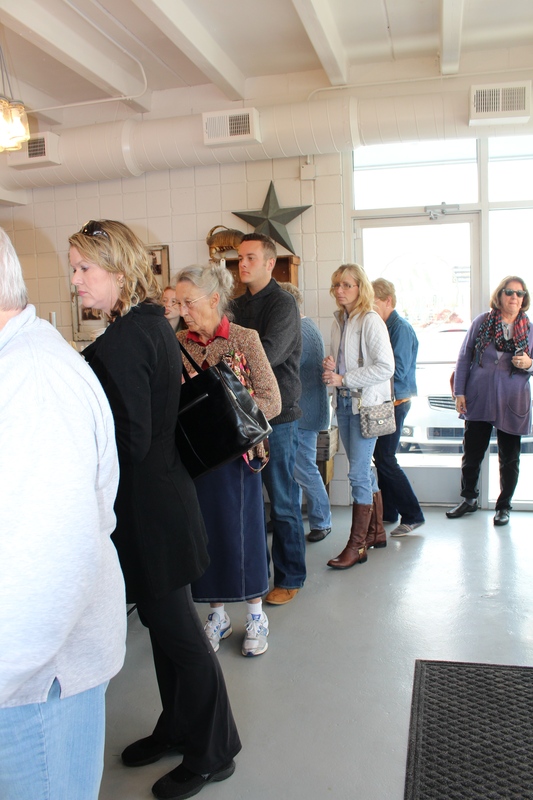 20 Responses to Buttermilk Sky Pie Shop: New sweet spot in Bearden! 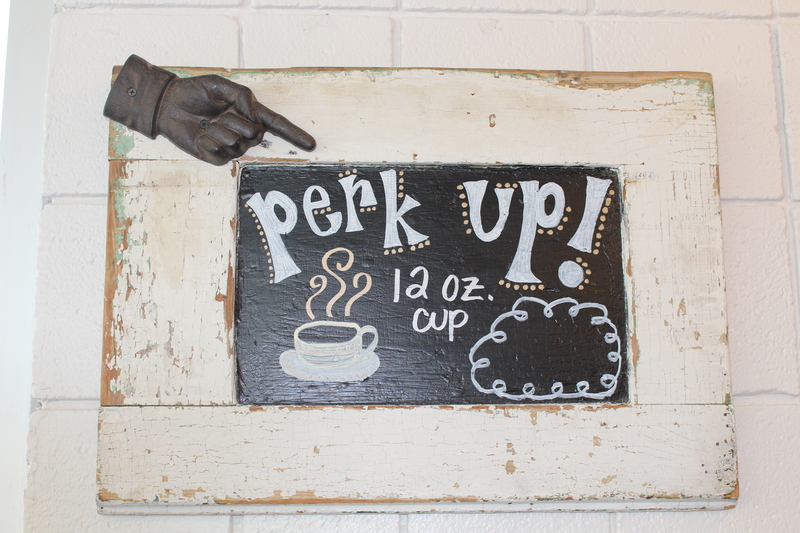 Pingback: Buttermilk Sky Pie Shop, Knoxville TN – Marie, Let's Eat! Pingback: Knoxville’s Biscuit Fest just keeps getting butter and butter! | Oh, the Places We See . . .
Oh, southern pie. . . . is the best ! So true. But I must admit — I’ve had more experience eating them than making them! This shop has a lot of temptations!!! They really do have good pies, but also thumbprint cookies and now strawberry shortcake! It’s a go-to place for many around here, especially for holidays and big events! OMG – I want one of everything! The pies are good! And now they’re making cinnamon rolls and thumbprint cookies. How am I ever gonna lose weight? I want to be just like Buttermilk Sky Pie when I grow up! What a fun comment! Thanks for stopping by. Wish I could send you a pie! I can SMELL the delicious things! Is it just me or does the name Bearden just make you smile from your toes? I never thought of Bearden that way — that’s the area in which we live, so it just says home to us! Thanks for reading! Bert loves the buttermilk pie because it goes so well with berries. Great to hear from you! What a great posting for such a wonderful shop. And, just in time for the holidays…. They will do well during the holidays. Everyone’s looking for a shortcut! Thanks for reading! I have not been anywhere near Knoxville for a long, long time. 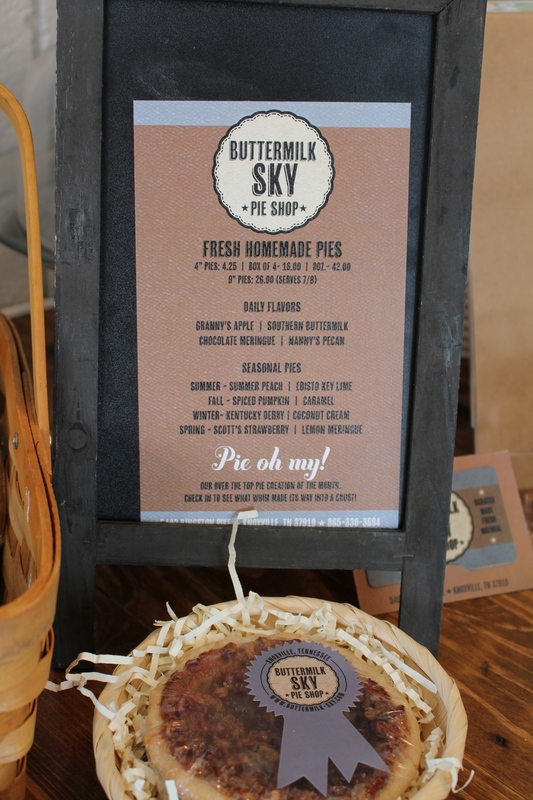 If I was there now, I’d head straight to Butter Milk Sky Pie Shop. And you’d love it. Pies are good!!! Come on down! Ha Ha! Easier said than done. I’ve never had a piece of buttermilk pie. It seems like this Sky Pie Shop would be the place to remedy that.